Good Morning, Celeste! What a pretty B&B. The fence design is neat and I love the sign..Great shots. Enjoy your Thursday! What an interesting fence. I've never seen one like it before. You just can't beat the Texas atmosphere and hospitality in the country B&Bs. really beautiful! thanks for sharing this neat place! Good morning my frienf. The Prairie is truly lovrly! What a neat fence and lovely home in the background there! Love The Prairie sign. Reminds me of traveling in North Dakota passing large expanses of farm land. There was an oven/range with the door open perched near an access trail that said "Open Range"...cracked us up! I've yet to visit Texas but hope to before long! I did read your posts and I find the Prarie B&B fascinating. The fence in its rustic style makes a interesting yet powerful statement. 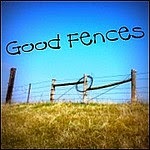 Ooooh, I enjoyed your fence pictures today, Celeste :) Thank you for sharing some country charm with us. Hugs and blessings to you, my friend! Barns, old homes and fences really say "country". How nice that you were able to stay at Rachel's place! I've always wondered about it so I'm off to look at your posts! Oh I would love to visit! Fab fences and prairie! Wonderful! Making the Good Fences blog run and I stopped by! What a great "rustic" fence this is and the welcoming sign is so cool. Looks like a wonderful place to stay. Love the fence! This post brought back such memories for me! I lived in Ledbetter for five years, worked at The Festival Institute and have many Round Top friends! Miss it and them! LOVE that rustic farm fence! I love that fence! That house looks a little big for a cottage! That's a grand old farm house. Just in here catching up! The fence design is a first for me. Thanks for sharing. What a great place to spend vacations and relaxing! I love living in the country, we have fences everywhere! Oh...how I would love to go stay at The Prairie on a vacation. Love the rustic fence! Love that prairie fence, Celestina. That fence is just as old and worn looking as I love, makes my fantasy work, with prairie stories- so wonderful, Celestina Marie. Super charming...it looks like it belongs in a storybook! What a lovely and rustic look! I would like to stay at The Prairie.Thanks for sharing the wonderful Rachel' s place. This is so neat! Thanks for sharing! Have a wonderful weekend! Pure Texas, pure charm - love those split-rail fences! And Happy Coming Mother's Day! What a pretty fence! I love the rustic look of it. And the sign... perfect. I hope you have a great Mothers Day friend! Oh yes indeed its a great rustic fence. I would love a visit to Rachel's place. Or even a Texas country drive before it gets too hot! Nice shots!